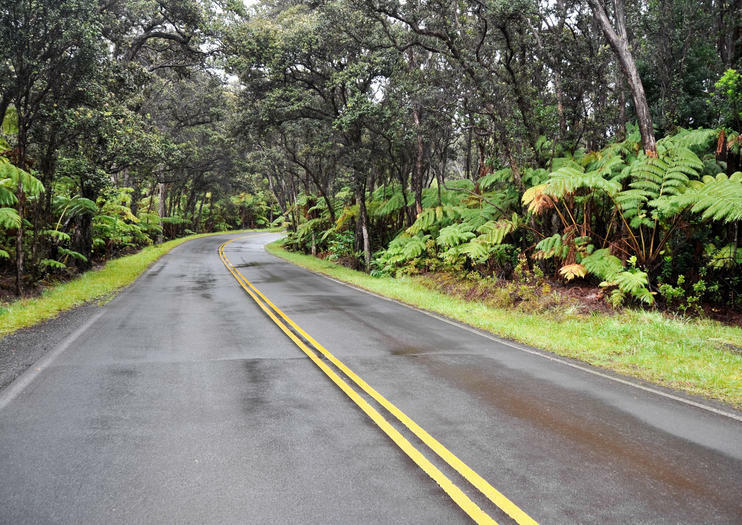 Located in Hawaii Volcanoes National Park, the Crater Rim Drive is an 11-mile road that allows you to easily explore a portion of the summit caldera or large pit crater of Kilauea. There are numerous scenic lookouts and hiking possibilities, so be prepared to get in and out of your car for the best views and experiences. How much you do really depends on how much time you have to spend. It takes approximately a half-hour to complete the stretch of Crater Rim Drive one-way, but the more you stop, the more you’ll see. Be flexible with your plans. It’s not uncommon for sights and sections to be closed due to volcanic activity. Start at the Kilauea Visitor Center to get the most up-to-date information, including ranger-guided hike schedules. Films are shown throughout the day to give visitors an introduction to the area and volcanology.